Click Keycode Management > List KMS Account to view all user KMS account. On the “action” user can modify KMS account created. "View" will open Account Detail. In Edit Account user can change information about enduser and Click "Save" to update. Click Detele to delete the user. This pop-up will appear. Click "OK" to delete the user. 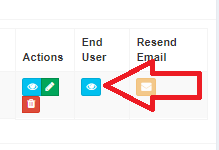 End User is a account under Enduser to view End user account click on "View"
This Page will appear and user can view all end User under End User. User can Manage account by using all this function.